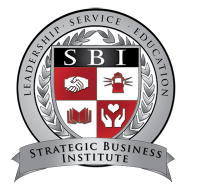 Strategic Business Institute (SBI) seeks to be on the cutting edge of distant learning and become a recognized and respected leader for quality. We will strive for a flexible delivery model of business education that prepares graduates to succeed in local, national and global environments.This will be evidenced by the quality and breadth of our educational programs, scholarly productivity of our diverse faculty, and the research and service contributions to the business community. We will strive to be a world leader in generating a dynamic knowledge base in the emerging global economic and business paradigm. We will assist our students to build their business and leadership skills through exposure of our cutting edge faculty. Our students will develop their skills so that they can be agents of change, innovation and leadership of both economic and transformational development. We also expect to be known for our superb scholarship programs and assistance to seniors, veterans and the poor. Donate a vehicle to SBI today and help educate the world.